One of the first events held at the rally is the Thursday night potluck dinner. It doesn’t matter if you just drove across town, or from Canada, there is nothing like meeting your new friends over a lot (and I mean A LOT) of food. One thing there is never a shortage of at the rally is food, especially desserts! First thing Friday morning we have what every camper has, coffee! 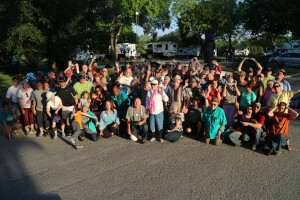 Volunteers host camper coffee and their site so everyone can yawn, stretch, sip, and get ready for the day. Tech Talk is a favorite activity every year, because there is so much to talk about and learn. Tech Talk is hosted by a technician at Princess Craft RV and is both on Friday and Saturday. Some of the hot topics in the past years have been batteries, camping off-grid, and everyone’s favorite gadgets. There is always something to share and learn at Tech Talk. Next up are the Camper Tours. Again, held on Friday and Saturday to fit them all in, camper tours are a laid back and casual approach to being nosy! Peek in other people campers, you never know what storage ideas you will pick up! Or open up your door to show off the tiny home you’ve created. 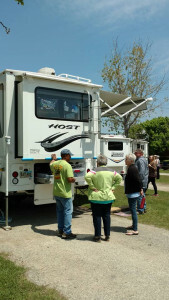 Some people who attend the rally are still shopping for the perfect camper, and this is the perfect way for them to get a good scope of what is out there and experiences from people who own them. The beer and wine tasting is a newer addition to the rally schedule, and it has gone over quite well! As with food, we always have an abundance of beer and wine at the tastings, which is good news, because after dinner, it’s dancing time! We have had several different groups play for us each year, but everyone’s favorite is Bob Appel. 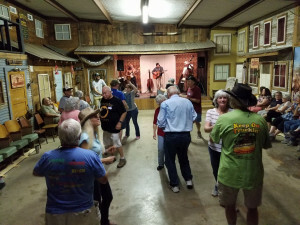 Bob has played for the Texas Truck Camper Rally for 5 years now, and is just the best you can get with classic country and western swing. A quick 2-step lesson before the band takes the stage and you’re ready to go! The music and dancing is the biggest event of the rally, and is really so much fun, even for the people who just like to sit back and enjoy the music. Prizes are given out, stories are shared, and everyone says their goodbyes until the next year. 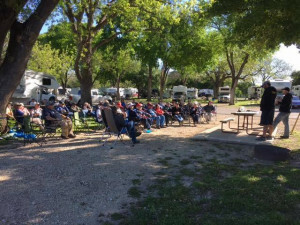 If you have never been to a Texas Truck Camper Rally, whether you have a camper or still looking for the perfect fit, sign up today and join us, you won’t regret it!